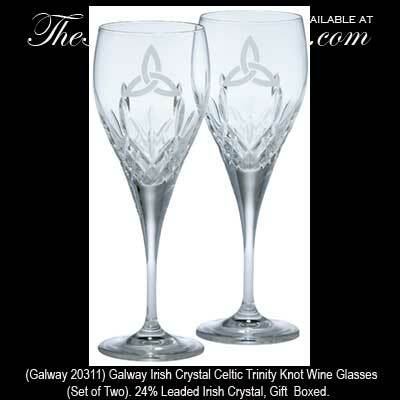 These Irish crystal wine glasses from Galway Crystal are enhanced with the Trinity knot. Galway Crystal presents this beautiful pair of 24% leaded crystal wine glasses with etched Trinity knots. These Irish wine glasses from Galway, Ireland measure 8 1/2" tall and are gift boxed with the Celtic knot history.